Roxy von der Blockhütte goes V1 in the working class under ADRK judge und Körmeister, Hans-Jürgen Radtke. Wasko von der Urbacher Höhe goes V1 in the working class under Yvonne Brink (FCI-Sweden). Wasko von der Urbacher Höhe goes V1 in the working class males under FCI judge, Dusko Pejovic. Roxy von der Blockhütte goes V4 in the Siegerin class females under FCI judge, Dusko Pejovic. Roxy von der Blockhütte goes V1 in the working clas females & Siegerin under Canadian judge, Dan Carlson. Wasko von der Urbacher Höhe goes V1 in the 18-24 month males & Youth Sieger under Canadian judge, Dan Carlson. Roxy goes von der Blockhütte goes V1 in the working class females under FCI judge, Nebojsa Savicic. Wasko von der Urbacher Höhe goes V1 in the 18-24 month males & Youth Sieger under FCI judge, Nebojsa Savicic. Roxy von der Blockhütte goes V1 in the working class females under AKC judge, Catherine Thompson. vSD Rottweiler will be traveling to Germany to pick up Wasko von der Urbacher Höhe from handler, trainer Daniel Kemp of "zwinger von der Holzhaussiedelung", in Dessau, Germany. Wasko von der Urbacher Höhe earns his VPG/IPO I working title with handler, trainer Daniel Kemp. Wasko von der Urbacher Höhe earns his Ausdauerprüfung or AD with handler, trainer Daniel Kemp. Wasko von der Urbacher Höhe earns his Zuchttauglichkeitsprüfung or ZTP under ADRK judge Hans Jurgen Radtke, with handler, trainer Daniel Kemp. Roxy von der Blockhütte goes V1 in the working class females, under FCI judge Bianka Miksic Kasun. Wasko von der Urbacher Höhe earns his BH/VT working title with handler, trainer Daniel Kemp. Roxy von der Blockhütte goes V1 in the working klass femlaes under ADRK judge, Uwe Petermann. Wasko von der Urbacher Höhe will be shown at the 41st ADRK Klubsieger-Zuchtschau in Escweiler, Germany by handler, trainer Daniel Kemp. vSD Rottweler's new male Wasko von der Urbacher Höhe goes V3 in the 12-18 jugend klasse, under ADRK judge Sigmund Trebschuh. Very strong class of 9 males. 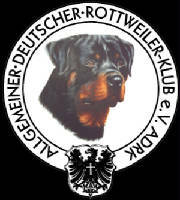 vSD Rottweiler will be traveling to Germany to pick up Roxy von der der Blockhütte & to purchase our new young ADRK male. Roxy von der Blockhütte earns VPG I (score269) woking title in Germany with handler, trainer Mathilde Agne. Roxy von der Blockhütte earns her BH/VT working title in Germany with handler, trainer Mathilde Agne. vSD Rottweiler will be traveling to Germany to deliver Roxy von der Blockhütte to, Klaus Jostock to be trained & titled (BH, AD, VPG/IPO I). Klaus is the owner & protection helper at klub BG-Speicher. Roxy von der Blockhütte goes V2 in he Open class femles under USA jusge Bill alexander. Roxy von der Blockhütte arrives in the US. RZvSD Rottweiler will be in Germany for 2 weeks attend the 37th Klbsieger-Zuchtschau (100 Jahre ADRK) & the IFR World Championships in rottweil, Germnay. We will also be visiting with good friends Jacqueline und Gido Räppold of zwinger von der Blockhütte. Lucinda von der Blockhütte makes V rating in the 12-18 month female class under FCI judge Olga Grin. 5th position of 9 females.